For more than 60 years, PRADCO has helped executives and HR leaders with talent assessment and development. Today, we pair that rich history with a modern, technology-driven approach to talent development. The Personnel Research and Development Corporation (PRADCO) was originally founded by Erwin Taylor, Erwin Nevis, and Richard Barrett in 1955. The office was located in Cleveland, Ohio, and some of the first clients were Republic Steel, National City Bank, Diebold, and Timken. 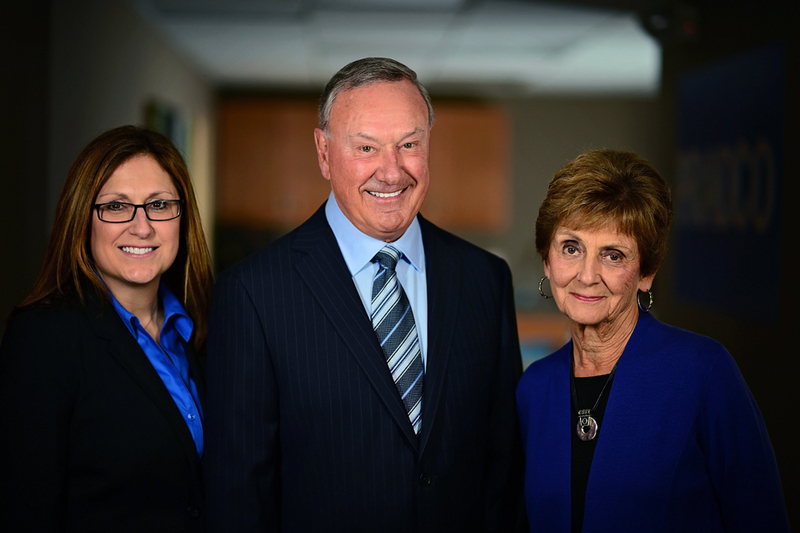 Stanley Rubin became the second owner in 1975, and Dr. Terry Owen became the majority stockholder in 1989. From those roots, our team has grown into a leader in the talent development field, with a diverse staff that blends Ph.D- and Masters-level management psychologists and cutting-edge talent development technology to help our clients achieve their organizational goals. Personnel Research and Development Corporation (PRADCO) was founded by Erwin Taylor, Erwin Nevis, and Richard Barrett. The office was located in Cleveland, Ohio, and some of the first clients were Republic Steel, National City Bank, Diebold, and Timken. Stanley Rubin, Salvatore Pizzurro, and Erwin Weiss became minority stockholders in the company. PRADCO was selected by Chevrolet to develop a multi-year program to evaluate and train employees who would be selected for promotion to the positions of District Manager and Area Service Manager. Terry Owen became a minority stockholder in the company after two years of service as Director of the Assessment Division. Erwin Taylor passed away unexpectedly, leaving Stanley Rubin as the majority stockholder and Terry Owen and Sal Pizzurro as minority stockholders. Stanley Rubin maintained the position of Chief Executive Officer, while promoting Terry Owen to President. Edda Owen joined PRADCO as a part-time employee and eventually became the full-time Office Manager. PRADCO was awarded a major project by Federated Department Stores. PRADCO was asked to evaluate a large number of high-potential executives across all divisions to determine their promotability to the highest levels of the company. After a relationship with PRADCO spanning several decades, Progressive Companies became PRADCO’s largest client, using the full array of evaluation services. Terry Owen purchased the stock of Stanley Rubin and became the majority stockholder. Goodyear and PRADCO partnered to develop a selection and promotion system for Sales, Sales Manager, Service Manager, and Store Manager positions in Goodyear’s retail operations. PRADCO worked with K-Mart and associated companies to evaluate and develop high-level executives. PRADCO also created benchmarks for effective Store Managers, District Managers, and Regional Managers. Kristin Tull and Kevin Owen (children of Terry and Edda Owen) became Vice Presidents and minority stockholders in PRADCO. Kristin began employment in 1991 as a staff psychologist while working on her Ph.D. Kevin began employment in 1992 as a Sales Representative while working on his MBA. PRADCO changed strategic direction as Kristin, Kevin, and Terry collaborated to build the company’s first index—the Sales Index—which is used to measure the behaviors that salespeople emphasize in carrying out their jobs. Recognizing the growing importance of the internet, PRADCO installed all tests and indexes on its website so clients could evaluate employees and candidates online. This dramatically sped up the evaluation process, while reducing costs for the clients. Kristin Tull and Kevin Owen increased their ownership of PRADCO and, along with Terry Owen, each owned one-third of the business. PRADCO celebrated its 50th year in business while continuing to build new products. Following Kevin Owen’s departure from PRADCO in 2007 to pursue personal business interests, PRADCO became a women-owned (52%) organization, with Kristin Tull and Edda Owen as majority owners. Kristin Tull was promoted to President and Terry Owen became CEO. PRADCO was certified as a Women-Owned Business by the Women’s Business Enterprise National Council. The certification process confirms the business is at least 51% owned, operated, and controlled by a woman or women. Larry Borodkin was promoted to Vice President in recognition of his consistent contribution to PRADCO’s growth. PRADCO celebrated its 60th year in business, further expanding its offerings to help clients build stronger organizations.